These are resources specifically set up to meet the needs or address the interests of various groups, such as women, persons of varied nationalities or ethnic backgrounds, and so on. The Riley Guide also provides pages of resources and information specifically intended for military personnel, ex-offenders and former felons, and disabled individuals – but there may be some overlap with those resources and the ones listed on this page. You’re certainly not limited to these resources, but they may have ideas or topics which speak directly to you. Even the resources listed under specific affinity groups may be useful to a broader audience. The Riley Guide’s page of Business & Employer Rankings also covers top employers for diversity groups. While you can find plenty of resources for your executive-level job search on The Riley Guide’s list of links related to The Executive Job Search, you may find that certain firms cater specially to groups of which you’re a member. Firms like this may be able to guide you toward positions for which your membership in this group makes you uniquely qualified, and they may also be able to help you learn to better develop and present certain traits that you possess by belonging to this group. The Domar Group, for instance, handle searches across numerous industries and job categories, but they specialize in identifying highly qualified bilingual Spanish/English, multicultural, and women candidates. Talent2050.net, meanwhile, is a leader in multicultural and diversity recruiting. They work across industries and across the U.S. On their website, you can review a list of current searches, submit your resume for consideration, and even upload your resume to the company’s database so they always have it on hand to match to new opportunities. Quite a few other companies also support diversity in the workforce, from the executive level all the way down to the entry level. Some of these companies serve as active recruiters and staffing firms, seeking openings for viable candidates; while others simply connect people with jobs and professional contacts; and still others provide advocacy on behalf of diverse groups in the workforce. Take a look at this list, and you may find that some are ideally suited to help you with your current employment situation. INSIGHTIntoDiversity.com includes job and internship postings for positions in academia, business, healthcare and the government. DiversityEmployers.com is targeted at recent college graduates, as well as at more experienced job seekers and professionals looking for information on careers, job opportunities, graduate/professional school, internships/co-ops, study abroad programs, and other employment and career advancement opportunities. DiversityJobs.com is a searchable job database developed to connect African Americans, Asian Americans, Native Americans, Hispanic people and members of the LGBT community with companies that are known for being especially diversity-friendly. Their website hosts direct job postings, and they also partner with several other niche sites to give employers more visibility in diversity hiring, while allowing diversity candidates a broader search capability. HireDiversity.com is a recruitment service linking qualified entry-level to senior-level candidates with Fortune 500 companies and the government – and their website also includes a job board. HirePotential.com is another staffing firm dedicated to helping people with disabilities, mature workers, veterans, welfare recipients and individuals from other specialty niche groups. And HireVelocity.com is a national recruiting company that assists companies to find the best talent from among diverse groups. If you’re looking for even more job boards, check out MinorityJobs.net, where you’ll find job listings and career information, along with news and info on civil rights, including immigration, education, government, and history; and MinorityProfessionalNetwork.com, a nice site with job postings, as well as business and lifestyle information. You may also want to take a look at TheMulticulturalAdvantage.com, where you’ll find job postings that include contact info for employers and recruiters; and at WorkplaceDiversity.com, where, in addition to searchable job listings, you’ll find profiles of employers, news and information targeted to various diverse audiences, and information on associations and organizations supporting and promoting minority and diversity interests. DiversityWorking.com is a very large site dedicated to promoting diversity in the workplace. Colorbars Network, on the other hand, is a professional and social network established to support the advancement of people of color working in media, entertainment and communication, via networking events, panel discussions, informational lectures, and mentoring programs. Their website also includes a job board. 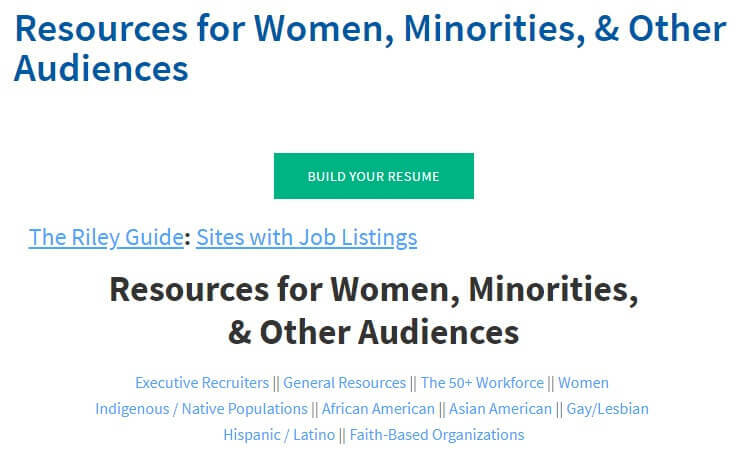 As you can see, the variety of diversity-friendly job sites is almost overwhelming – but spend a little time skimming through them and you’ll probably find one or two that you can use as steady resources of career info. It’s never too late to make a change in your career – even if you’ve spent decades building up expertise in one area and feel ready to start from scratch in another. But changing careers after the age of 50 brings certain challenges – most notoriously, the dreaded “overqualified” label. The good news is that you can actually spin your age and experience into positives in job interviews, by explaining that fulfilling work has become more important to you than money, and you can bring insights gleaned through years of work in other fields – all for the same pay as a standard entry-level employee. Some online resources can also help you prepare to launch your new career, and provide career tips tailored especially for people 50 and over. WhatsNext.com includes advice on second careers, numerous free financial planning tools, a searchable directory of advisors who can assist with your career change or life plans, a selection of tools for self-assessment, a searchable job board, and blogs written by people making their own transitions to new jobs, careers or phases of life. Another handy website is Workforce50.com, a searchable job board where employers post openings targeted at employees over 50. You may also want to check out RetireeWorkforce.com, which focuses on providing part-time, full-time, flexible, seasonal, and temporary positions for retirees who want a little extra income, or just have time to fill. RetireandConsult.com, meanwhile, offers advice on how to become a consultant and start a consulting business, gives you a place to post your resume for free , and offers listings of consulting opportunities for you to consider. Some organizations specialize in offering tips and support to boomer-generation workers. ExperienceWorks.org is a national nonprofit organization that provides training, employment, and community service opportunities to low-income seniors – including programs designed to help mature individuals enter the workforce, secure more challenging positions, move into new career areas, or supplement their incomes. SeniorServiceAmerica.org is another nonprofit organization that helps arrange training and employment opportunities for older adults who work to fill real community needs. You may also want to take a look at the U.S. Environmental Protection Agency’s Senior Environmental Employment Program, which provides a wide range of opportunities for retired and unemployed Americans age 55 and older to share their expertise with the Environmental Protection Agency (EPA), by putting their skills to use supporting a variety of environmental programs. Open positions include everything from secretarial work to engineering to writing/editing – and these jobs are available all over the country. If you’re looking for career advice and support targeted at women in the workplace, plenty of websites exist to provide just that. Some of these sites are mainly designed to allow women to share their stories and trade insights, while others offer practical tips and news updates. Some job boards even target their listings specifically toward women. As you move forward in your career, sites like these can serve as useful supplements to the more general job boards and advice blogs you’re used to frequenting. TheDailyMuse.com, for example, is a website dedicated to offering female-oriented information, advice and tips on entrepreneurship and careers – including articles on a variety of topics, from job-searching to careers to health and money; as well as a job board. TheNewCareerist.com, meanwhile, is a blog full of advice designed to help women in the early stages of their careers, written by a woman with more than 20 years of business experience. You may also want to connect with an organization that offers support for women in the workplace. AdvancingWomen.com offers help with skills training, as well as career-planning strategy. The National Association of Commissions for Women (NACW) provides a list of Member Commissions, each a government commission tasked with supporting equity and justice for women. Women in Technology International (WITI.com) helps provide mentors, networking opportunities and jobs for qualified women in technological fields. WomenForHire.com throws career events for professional women, promotes networking, and offers career coaching and other job search support. And Women in Business and Industry (WBI-I.com) serves as a bridge between women and recruiting firms. While you’re at it, you can check out some job boards targeted toward female workers. IVillage.com offers interactive services and support to women in many areas of interest, including work-from-home and entrepreneurship. Look in their “work” area for information on salaries, careers, work-from-home ideas, and some job listings. The Feminist Career Center is a large searchable job/internship database, broken down by geographical region. WomensJobList.com, on the other hand, gathers job listings from a variety of other sites and presents them all through an easy-to-use search interface. And Womans-Work.com lists alternative and flexible opportunities for women, including part-time, work-from-home, flex-time, telework and freelance opportunities. Some companies take great pride in their commitment to working with native populations and abiding by the values of those cultures in their business practices – and for the rest, organizations have sprung up to help preserve those values. If you want to support the upholding of Native American rights, the websites in this section can connect you with others who share your passion, and with opportunities to make an impact. The American Indian Science and Engineering Society (AISES.org) is dedicated to bridging science and technology with traditional Native values, by helping American Indian and Native Alaskan students prepare for careers in science, technology, engineering and business. The Society’s website includes a career center with a resume database for members, as well as a job board that’s open to the public. NativeWeb.org, meanwhile, supports technological education for native peoples, and promotes communication between cultures. You may also want to check out the State University of New York Western Consortium’s Directory of Internships and Fellowships for Native Americans, a resource provided on behalf of members of the Six Nations (Seneca, Cayuga, Tuscarora, Onondaga, Oneida, and Mohawk) by a network of Native American communities and students. Quite a few tribal confederations also have their own nonprofit organizations. For example, ColvilleTribes.com, the official website of the Confederated Tribes of the Colville Reservation in Washington state, provides information about the confederation’s government, its business council, upcoming events, and current job openings. You can easily track down tribal and confederate organizations in your own area by Googling terms like “[name of your state] + tribal confederation” or “[name of your state] + Native American tribal organization.” If you get in touch with organizations like these, they’ll often be able t connect you wih some volunteer work – and possibly even a job. The groups listed in this section are dedicated to advocating on behalf of African American people in the workforce, and to providing mentors and other forms of career support. Not all of them provide job listings, but they can still connect you with experienced workers who can give you tips on finding a job, moving up the carer ladder, and even – if it comes down to it – fighting workplace discrimination. BlackCollegian.com offers job resources, resume information, career guidance, and all kinds of other great articles and resources. BlackPerspective.com is a free electronic magazine featuring job, career, and business information for African Americans. While they do have a job board, they focus more on connecting African American candidates with employers who support equal opportunities. If you want to get straight to the job openings, the National Black MBA Association (NBMBAA.org) offers a free job and resume service, but registration – including posting of your resume – is required in order to view a lot of the information posted on the site. UrbanLeagueJobsNetwork.com, on the other hand, offers a large searchable job database that anyone can view – in other words, you don’t need to register to search the database, or to apply for jobs that have provided contact information. You will need to register, though, if you want to use the job alerts or “apply online” feature. To connect with groups that support and offer resources for Asian Americans in the workforce, take a look at the websites listed in this section. Some may be able to offer you volunteer opportunities, where you can work on behalf of workplace diversity or pass on your own expertise, while others can connect you with other Asian Americans – and advocates for Asian American employees – for networking; and still others can help you track down actual job listings. For a wide range of career support services, check out Asian American Economic Development Enterprises (AAEDE.org), a full-service nonprofit organization dedicated to economic self-help for Asian-Americans and others. The organization occasionally lists job opportunities on its site by company name, and the site also links to additional resources for your search. In terms of outreach, the National Association of Asian American Professionals (NAAAP.org) is a great place to start. This all-volunteer organization helps Asian American professionals connect with one another, and with resources that’ll help them take the next steps in their careers. And the website of the Asian MBA Leadership Conference – AsianMBA.org – offers a job database where employers can post opportunities and Asian MBA members can post resumes. Here, you can search and review the jobs listings, and submit applications to any that include contact information. Supporting equality in the workplace takes effort from many dedicated workers, and plenty of LGBT advocacy organizations would be glad to have your help with this mission. On their websites, you’ll find information about LGBT career events, packets of info on workplace rights and how to defend them, and even job listings with employers that are especially LGBT-friendly. And of course, if you’d like to jump in and support equality more actively, you can find info on volunteer opportunities as well. EchelonMagazine.com provides business news and information targeted to the LGBT community, along with an employment board. LGBTCareerLink.com offers visitors and users the opportunity to view job opportunities from a broad variety of employers, to review career resources, to learn about upcoming events for the LGBT community, and to network. You can review jobs and employer profiles, look at the career center, and check the events without registering – but to get into the actual networking, you’ll need to register and create a profile. You may also want to take a look at the Human Rights Campaign’s Corporate Equality Index, an online tool designed to help gay, lesbian, bisexual and transgendered people examine the workplace policies of potential employers. The Index measures the treatment of gay, lesbian, bisexual and transgender employees, consumers and investors by various companies according to a variety of metrics, while the Employer Database allows you to search for companies with various non-discrimination policies in effect. And by the way, HRC also offers Law and Research Fellowships and Internships. The Internet provides plenty of opportunities for you to get involved with Latino issues in the workplace. Some organizations advocate on behalf of Hispanic and Latino employees, or help people of Latino descent connect with one another for career support. Others provide news updates relevant to employees of Hispanic/Latino descent, while some even provide job listings from employers who strongly support workplace diversity. No matter where you fit into this picture, some of these sites will provide the info you need to get plugged in. For advocacy on behalf of Hispanic and Latino workers, check out The Hispanic Alliance for Career Enhancement (HACEOnline.org), which provides guidance and support from high school through to all levels of the professional ladder. The Alliance sponsors regional recruiting and networking events, and their website also hosts a job board and resume database. Other organizations focus on Hispanic/Latino issues in relation to specific fields and sectors. For example, the Society of Hispanic HR Professionals (SHHRP.net) hosts monthly networking meetings, along with regular career fairs and seminars – plus, their website includes links to local employment resources and career advice. And the Society of Hispanic Professional Engineers (SHPE.org) provides networking opportunities and other forms of support for Hispanic people in engineering, science and other technical professions. If you’re aiming to jump straight into the job info, Hispanic-Today.com is a good place to start. This free electronic magazine features career, job, education and business resources for Hispanic people. LatPro.com also offers a searchable resume database and job postings, including the option to set up email alerts for jobs that fit your criteria. iHispano.com offers a searchable job database, along with articles on interviewing, preparing your resume and other career-related topics. Last but not least, you’ll definitely want to check out Saludos.com. This huge website provides all kinds of resources, including a career center with job listings and other information; an education center with announcements of internships, mentoring programs and scholarship opportunities; a resume pool where Hispanic job seekers can post their resumes; an article archive with recent articles from Saludos Hispanos magazine; and the Hispanic Resource Index, which lists links to additional resources relevant to the Hispanic community. Sometimes it’s nice to know that you’re working for an employer who shares your faith – or at least supports the values you uphold. Thus, this section lists websites that can help you connect with employers of your own faith, get career counseling from experts who share your beliefs, and expand your network within your community of believers. Although the sites listed here don’t restrict their services to people of the faiths they support, you’ll find that their services are ideally tailored to members of those faiths. And if you have trouble finding what you’re looking for in this section, you can take a look at The Riley Guide’s pages on for Ministry & Religion and Church Administration. For Christian-oriented career resources, ChristianCareerCenter.com is a good place to get started. This site is run by professional Christian career counselors, and it includes career consultation services, a resume bank, and career guides. ChristianJobs.com, meanwhile, posts job openings, positions wanted, and resumes, often for Christian-based nonprofits. Although these jobs aren’t limited to Christian applicants, this site won’t list jobs posted by employers who discriminate against any person for religious reasons. If you’d like to work directly with a church, check out ChurchStaffing.com. Positions in Christian ministry make up the majority of the job listings on this site, but businesses looking for employees with Christian ideals also post jobs and review resumes here. Several websites are dedicated to providing job listings and other career help for people in the Jewish comunity. Hillel.org, the website of the Foundation for Jewish Campus Life, includes information about internships, study opportunities, grants, awards and scholarships, as well as career opportunities with the Foundation itself. JewishJobs.com includes job listings from more than 5,000 Jewish nonprofits, all of which are viewable through an easy-to-use search interface. Basic usage is free, and you can view a lot of the info without even registering – but the site also offers premium accounts that open up exclusive postings for rabbinical positions. And OUJobs.org, the job board of the Union of Orthodox Jewish Congregations of America (more commonly known as the Orthodox Union), offers a variety of free-to-view job listings across the U.S., Canada and Israel. The Islamic Society of North America (ISNA.net) also features a job board, under the Careers section of the Society’s website. Most of the jobs listed here are with ISNA itself, but the board also includes some jobs posted by other organizations – mostly, as you might expect, are connected with the Muslim faith. Some of the listings include contact info for the organization or person who posted the job, and all of them are free to view. DiversityJobs.com — Huge searchable job database, focused on openings with particularly diversity-friendly employers. HireVelocity — Nationwide recruiting company that matches diverse employees with supportive employers. WorkplaceDiversity — A job-search database that also provides company profiles and lots of other career info.